For nearly 40 years, Barry J. Nace has worked to protect the rights of victims of medical malpractice and other personal injuries. Throughout his career, he has proven that multimillion-dollar awards are not a matter of luck, but the result of experience, hard work, outstanding trial skills, and an unquestioned dedication to justice. To date, Mr. Nace has produced dozens of verdicts and settlements in excess of $1 million with three in excess of $30 million. In his pursuit of justice Mr. Nace has tried and developed scores of groundbreaking cases throughout the country at every level of the court system. He is admitted to more than a dozen Bars, including the U.S. Supreme Court. One of his cases, Daubert v. Merrell Dow Pharmaceuticals, Inc., in which the Supreme Court eased the standard for the admissibility of expert testimony, has generated more than 100 articles, newsletters, and websites devoted to an ongoing discussion of this landmark decision. Mr. Nace has been repeatedly recognized as one of the best trial attorneys in the greater Washington, D.C. metropolitan region. He was awarded Attorney of the Year by the Trial Lawyers Association of Metropolitan Washington, DC (TLA-DC); he was also honored with the Special Recognition Award, as well as the Outstanding Achievement Award, by the organization. 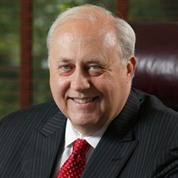 He has been a finalist several times for Attorney of the Year by the Trial Lawyers for Public Justice. Mr. Nace has also been chosen by other attorneys as one of the Best Lawyers in America® for the past 20 years and repeatedly selected one of the Top 100 Lawyers in Metropolitan Washington, D.C., as well as Who’s Who in American Law. Mr. Nace’s private practice is enriched by his commitment to advancing justice for individuals in the profession at large. He served as president of the American Association for Justice (formerly the Association of Trial Lawyers of America), the largest and most prestigious trial bar in the world. His many other posts at AAJ have included Chair of the AAJ PAC, which lobbies to promote justice and fairness for injured persons. Mr. Nace has also served twice as president of the TLA-DC. He has been elected by his peers as a member of the International Academy of Trial Lawyers, and to the National Board of Trial Advocacy, of which he has recently served as president. Mr. Nace formerly served on the Board of the Public Justice Foundation, of which he is a founding member. Mr. Nace has also been elected to the prestigious American Law Institute, having recently achieved Life Member status, and has been elevated to the highest rank of Advocate with the American Board of Trial Advocates. Mr. Nace also lectures frequently on trial advocacy, medical malpractice, and product liability at Bar and other professional associations and law schools. Mr. Nace graduated from Dickinson College in 1965 with a B.S. in chemistry, and from Dickinson School of Law in 1969, from where he was also awarded an honorary Doctor of Laws degree in 1994. He lives in Maryland with his wife of nearly 30 years and has three grown sons, all of whom now practice law. Past President, Trial Lawyer Association of Washington, D.C.
Trial Lawyer Association of Washington, D.C.